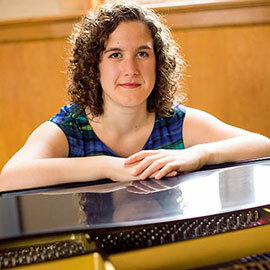 After graduating with her Bachelor of Music in performance from the studio of Leslie De’Ath at Laurier, Mary Castello ventured to McGill University graduating with her Master's in Collaborative Piano in 2016 from the studio of Michael McMahon. For 2016, Mary will join the Yulanda M. Faris Young Artists Program (YAP) with the Vancouver Opera as their pianist. The program engages, enriches, mentors and trains rising young Canadian opera artists and offers a bridge between formal academic educational programs and the professional world in a supportive and encouraging environment. Pianists, under the guidance of the Vancouver Opera music staff, work with YAP singers in regular coachings and may also act as rehearsal pianists for mainstage productions. Mary will be the reptiteur for the Vancouver Opera's productions of Hansel and Gretel and their festival productions of Dead Man Walking and Othello. She will also be the pianist for the YAP productions of Opera Tales and ﻿Cendrillon﻿. To learn more about Mary, visit her website www.marycastellopianist.com. To share your alumni news, email choosemusic@wlu.ca.